It is important to get started, but it’s more important to keep going and finish strong, even when the chips are down. God has a plan for each of us. But it’s up to us to bring that plan to life by working through the challenges. There will be inevitable push-back and that’s when it’s most important to push forward. Our destiny is our potential, not a guarantee. We must participate in His plan; we must persevere and overcome the odds. In doing so, our destiny becomes more rewarding than we could ever imagine. 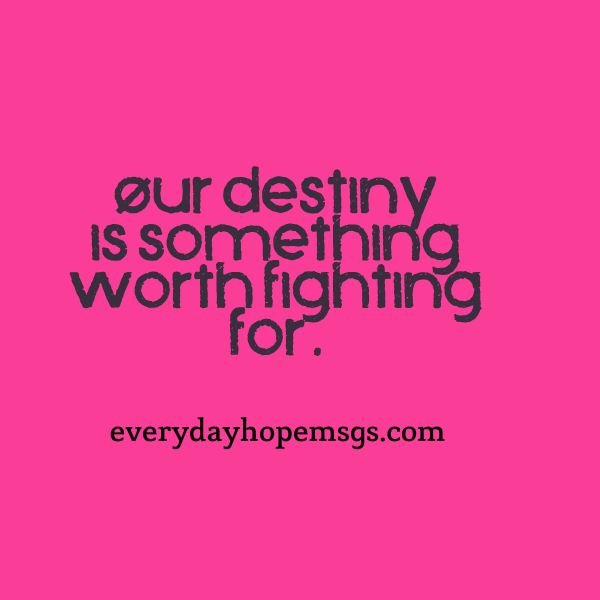 Our destiny is something worth fighting for. Make the choice to develop your potential. Each day, learn something new and refine a skill. Make a conscious effort to grow, no matter where you are in life. Commit to moving your life and your dreams further each day. With God on your side, you are fully equipped to fulfill the highest vision for your life. The finish line is closer than it may seem. Make the commitment today to keep going and finish strong. Did you like this Every Day Hope Message? Get your daily dose of inspiration, delivered right to your inbox – sign up at: http://everydayhopemsgs.com/subscribe/ and receive a free download of my eBook, Days of Hope: 72 Inspirational Messages Designed to Start Your Day Right!